To those who know me in real life, it’s no secret that I find dark natures absolutely fascinating. There are a multitude of troubling books on my shelves with themes and subjects that touch upon the unsavory, unwholesome truths we hide from ourselves. Carl Jung referred to our dark self as the archetype of the Shadow–a universal, unconscious symbol, a sort of primordial memory carried forwards through human consciousness. Shadows are a threat, an inverse reflection of our selves. To see our shadows clearly, we have to confront them for what they really are: the dark parts that both belong to us and are completely repugnant at the same time. And, oh, boy, does Hannibal play with this idea in fascinating ways. 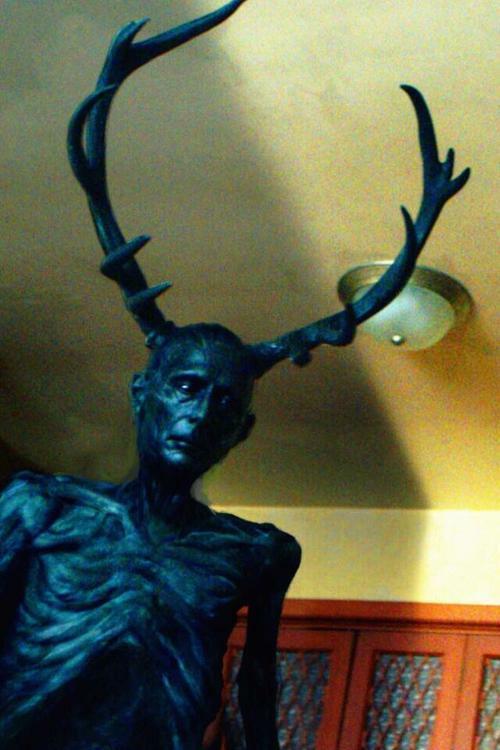 When Will first confronts the Nightmare Stag, it has a somewhat recognizable shape. This stag with feathers takes strange dimensions in his nightmares, defining itself more and more with each appearance. As Will gets closer and closer to the truth–that Hannibal is stalking him as well–the stag begins to change. But a stag is an odd choice for a representation of Hannibal, isn’t it? Deer are typically prey, not predators. Maybe this is a hint from Will’s unconsciousness that the predator is hiding himself among them, a wolf in sheep’s clothing, so to speak. Less cliche, more in line with the image of Garret Jacob Hobbs. After Will kills Hobbs, it makes sense that his shadow would take such an obvious form. As he edges closer and closer to the question of whether he’s a monster, too, the stag abruptly changes into a man. This man-shaped monster is clearly a predator, something that terrifies Will to have inside his head. His antlers are reminiscent of Cernunnos, a horned god of the hunt in Celtic mythology. Cernunnos is typically associated with fertility and wildness, but this version of Will’s Nightmare Stag is much more of a threat. This version of the stag conjures a repressed primal nature, a need to hunt that cannot be controlled. This is all perfectly in line with what happens next. Will coughs up a human ear and stares at it in horror, unwilling to believe he’s become the thing he fears most. The ear is undeniable proof, though, irrefutable evidence that he is the Chesapeake Ripper. But then we see the Stag’s true form. The tricky thing about the use of this particular symbol is that in this shot, Will does not see the Nightmare Stag for what it really is. We see Hannibal in true Wendigo form, antlers and all, and we realize the stag that has been haunting Will was Hannibal, but Will does not. And that’s what makes the start of Season 2 so brilliant. Will and Hannibal both state that they’re trapped in each other’s heads. One could argue that for these two incredibly self-aware characters, their individual shadows have to take physical form. If Hannibal played as Will’s shadow in season 1, I can’t wait to see what’s ahead for Season 2. I doubt we’ll see a correlating symbol, but who knows? Some people might argue against using motifs and symbols in stories, that they’re obvious or easy to figure out, but Hannibal makes an excellent argument for why you should. Get inside your characters’ heads. Find out what they fear, what they consider to be their antithesis. How can that be toyed with? What kind of seeds can be planted to keep your reader guessing? As for me, I’ll be over here, considering a Horned God of my own. I’m only a few chapters into this draft of THE WILD HUNT, but I’ve got some fun, scary ideas for what’s ahead. Stay tuned.